Mini mushroom log experiment works! Anna Which doe to breed? 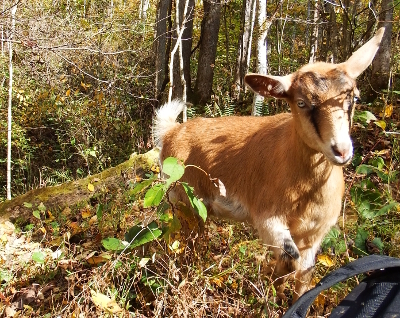 I'd been planning on breeding Artemesia again this fall because conventional wisdom has it that the very earliest a doeling should be bred is 7 months and that even that is dicey. 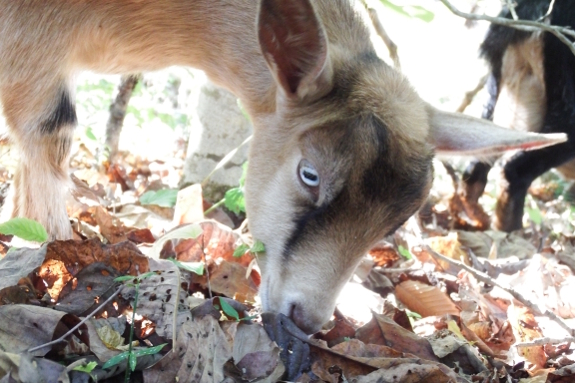 However, conventional wisdom also has it that you can breed a doeling when she's attained 70% of her adult weight. A session with the weight tape this week turned up the information that Aurora is already 77% as heavy as her mother and is, in fact, the weight Artemesia was at her first birthday. Now, some of that weight is fat. I've been lax on chasing Aurora away from her mother's dinner and those concentrates, combined with browse and lots of milk, mean our baby is pretty darn chubby. Still, I'm starting to think maybe we should put her growth spurt to good use. If we breed Aurora this fall, then Artemesia can gain back her milking weight at her leisure and take a year off while Aurora loses some of her excess weight the natural way. 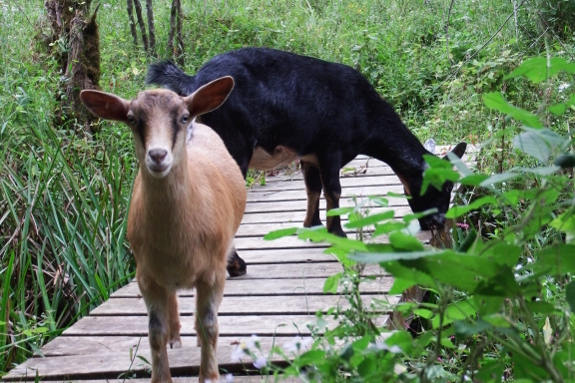 I'd be curious to hear from experienced goatkeepers. Would you breed a big, fat goatling at her earliest possible breeding date or hold her over to the next year for safety? To balance out the Huckleberry post from earlier I recycled this photo of Strider. A week of hummingbird diet (low fiber, low fat, frequent small feedings) plus imodium has given me a new lease on life. I'd forgotten what it was like to be able to think straight! A trip to the gastroenterologist has confirmed that I'm on the right track. If I can keep my current regularity while weaning myself off the imodium, I can slowly ease myself back onto my beloved vegetables over the next few weeks. That said, I'm not planning on diving right back into the daily grind. 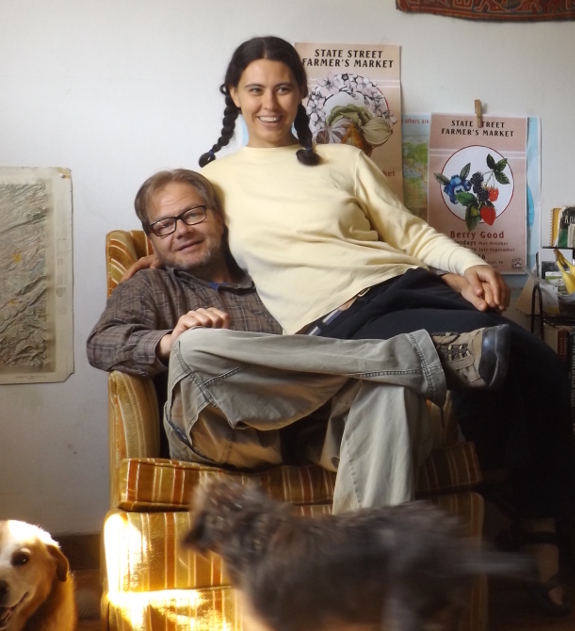 As Mark points out, the beauty of an independent homesteading lifestyle is that you can change your schedule to give your body the rest it needs. Biological causes aside, I strongly believe I brought this entire episode on myself by getting stressed out this summer and then pushing through farm and business tasks that could jolly well have waited until I healed. Yes, the farm won't be as perfect if I keep to my current schedule of only working half time (and not even that if my bowels complain). But what's the point of living on a perfect homestead if I'm too sick to enjoy it? Hopefully I won't forget this important lesson when my dreams get bigger than my muscles and I'm once again tempted to take on too much. mark Mini mushroom log experiment works! 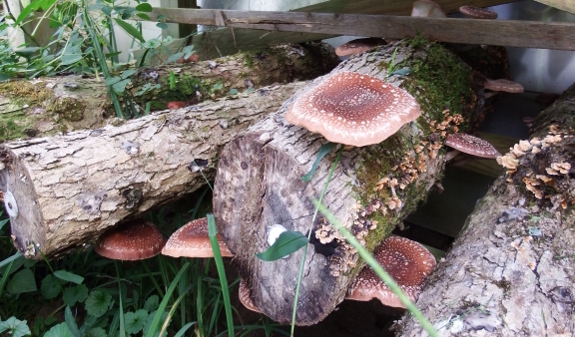 Our mini mushroom log experiment showed some impressive fruiting yesterday. We thought having a smaller area to colonize would prompt fruiting a little sooner compared to a full size log, but it seems the pace is the same as the big logs. I wonder how much a fruiting log like this would bring at a Farmers Market? 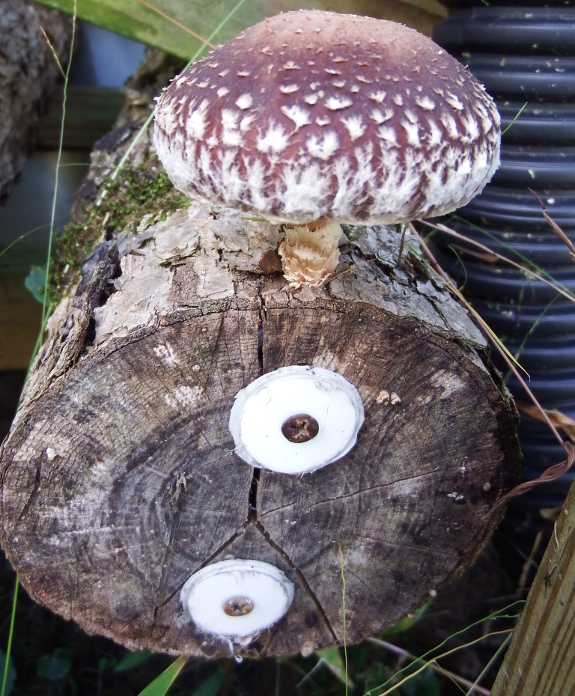 Despite its lack of an evocative name, the WW70 shiitake really came through for us this week. Temperatures dropping into the mid-40s in the recent past set the logs off into a heavy flush. 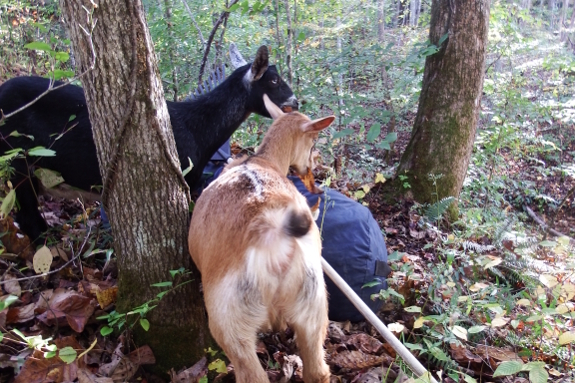 Field and Forest Products suggests the strain will keep producing deep into the fall...which means we're, for the first time, going to have to decide how to preserve shiitakes! Our new window is going to be 24 by 24 with side to side opening. I was intrigued to discover that the magazine in which I was recently profiled is based in Gray, Tennessee, only an hour down the road from our farm. The newish periodical has a fun feature where you can read the current issue online too. Perhaps you'd like to check it out? I got a great comment from asaf this week, and I'd like to answer it here bit by bit just in case another Southerner is considering a similar cover-crop experiment. 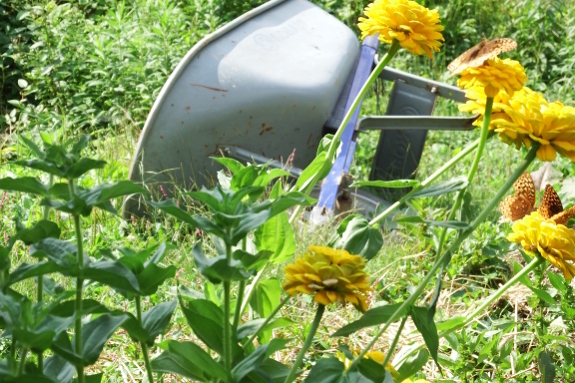 "I have about 1/5 acre of weedy ground that I plant to cover crop over winter. Below is my current plan. I would love to hear some feedback on this. I do not have any machinery but can pay for such services if justified. "Goals: weed suppression, soil improvement, erosion control. Crop: 1. oats/vetch/clover. 2. oats for straw. "The ground will be lightly plowed after the first rains in mid October. I plan to hand-broadcast the seeds and need a good solution for how to cover them afterwards." I've had good luck simply sprinkling a light coating of straw over the ground after broadcasting cover-crop seeds. The straw is enough to confuse the birds and keep the seeds damp as they germinate, but not enough to prevent the seedlings from growing toward the light. The photo above, from Homegrown Humus, shows the density of straw I recommend. "In the spring, I plan to kill the cover crop by cutting it down with a scythe, allowing it to smother itself under its own cuttings below a layer of straw harvested by the grain rows. 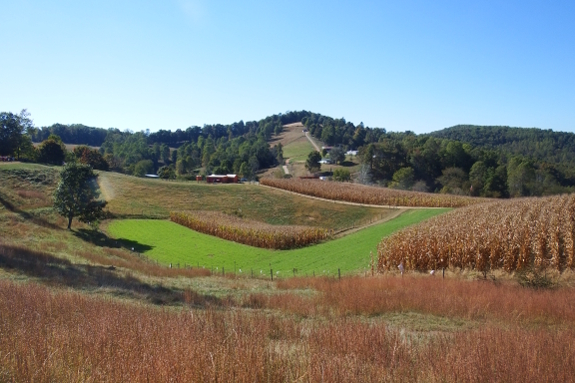 "Essentially, I will be creating a 1/5 acre compost pile that is low enough to not necessitate turning and covered by straw on top to preserve moisture and smother the cover crop. 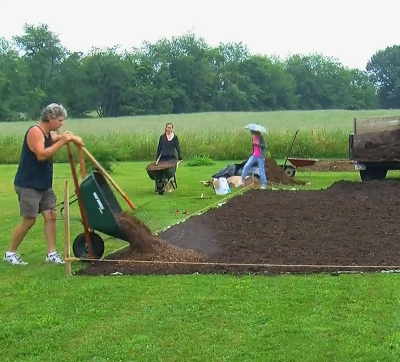 "I plant to plant a variety of vegetables into this. The bulk will be corn into the vetch rows, and peanuts into the pure oat rows. 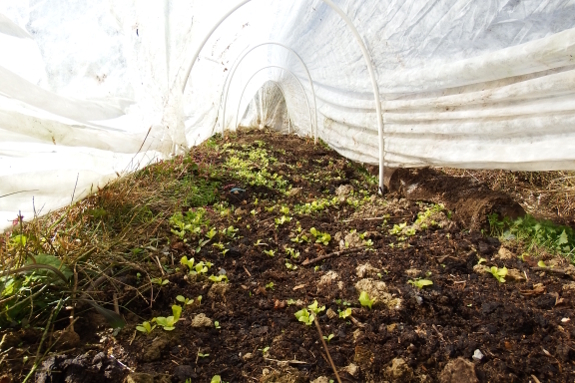 Might do a batch of radishes before the peanuts as a quick spring crop to suppress nematodes." Unfortunately, smother-killing is going to be a tough call for the species mixtures you plan. 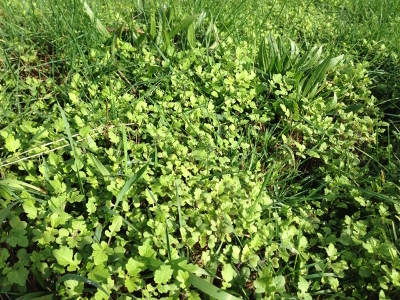 Most clovers and vetches are perennials, which means they'll grow back vigorously after cutting. And in your Deep South location, the oats aren't going to naturally winter-kill for you the way they do here. Your pure-oats area will be the easiest to manage. If you wait until the oats achieve full bloom and then mow them very close to the ground, they will hopefully die for you. I haven't done this myself since our oats naturally winter-kill, but we use this method with rye with good success. If you tweak your legume species a bit, you might have better luck ensuring they perish on command. Crimson clover is an annual that is reputed to mow-kill reliably at bloom. I haven't tried that myself, but my father (in zone 8) has told me that his crimson clover naturally dies after going to seed, then the seeds don't sprout back until the fall. 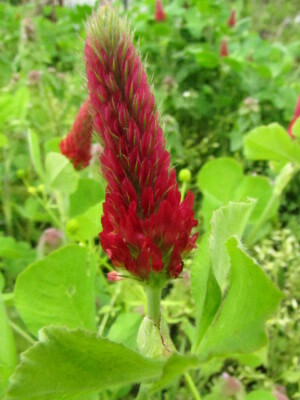 So you might get away with letting crimson clover become a no-work, winter cover crop that comes back year after year. 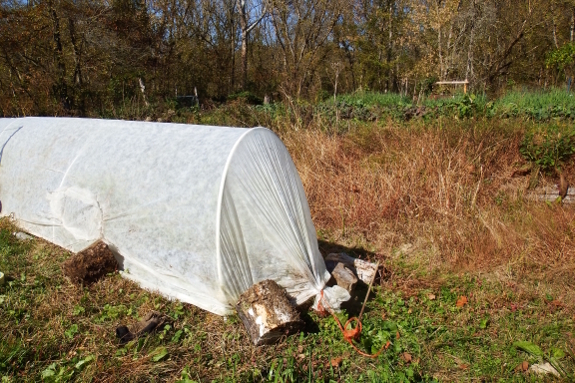 If all else fails, you can solarize your cover crops after cutting them close to the ground in the spring. This is probably more realistic on your scale than the kill mulches I use on smaller expanses of plants-that-refuse-to-die. I hope that helps, and I also hope you'll report back with some pictures and notes as your experiment progresses! I adore cover-crop experiments and would love to see how yours pans out. 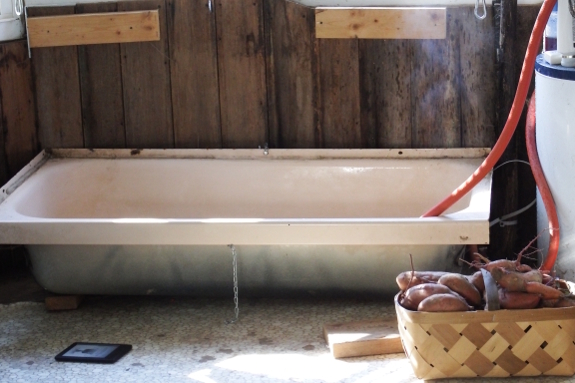 Today we moved all the dried sweet potatoes inside for Winter storage. After some experimentation, I discovered that homemade juice had too much fiber and homemade chicken stock (even with the fat skimmed off) had too much fat. Both went on my no list. Luckily, storebought juice suits my stomach better...but even the non-tomato-based "vegetable" juice is mostly fruit sugars. 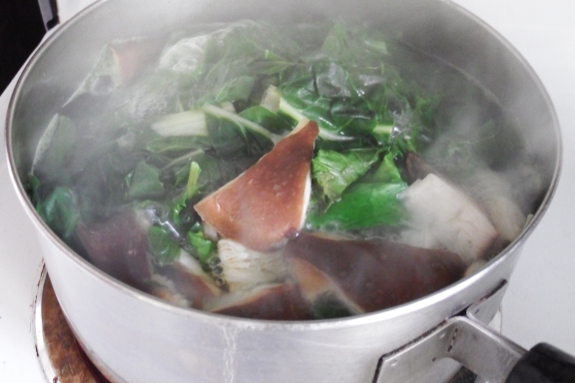 However, I discovered that I could stew up certain vegetables --- notably leafy greens and shiitakes --- then drain off the water and mix it with storebought juice for a tasty and nutritious treat. I guess I'll be drinking my vegetables this month after all. These new Enterprise apples have everything going for them. "If you are fielding cover crop questions, could you please speak to the compatibility of that concept with no-till gardening (Back to Eden concept with wood chips). I live in the north with great availability of wood chips. I'm not certain how to combine the two methods. Thank you!" For those unfamiliar with the concept, the Back to Eden system is similar to the the instant no-till techniques I outline in Small-Scale No-Till Gardening Basics (which is available in print as part of The Ultimate Guide to Soil). Basically, you lay down a cardboard kill layer in new ground, top it off with three to four inches of compost, then add wood chips on top as mulch. Okay, back to merryann's question. It is tricky to choose cover crops that suit no-till gardening, but luckily there are several that work well once you weed out the problematic species. The tricky part is making sure you select cover crops that are easy to kill, either with winter cold (probably a good choice for you), mowing at bloom time, or hand weeding out. My top choices given those constraints are buckwheat for summer, oats and oilseed radishes for late summer planting with optimal fall growth, and rye for full winter and spring coverage. 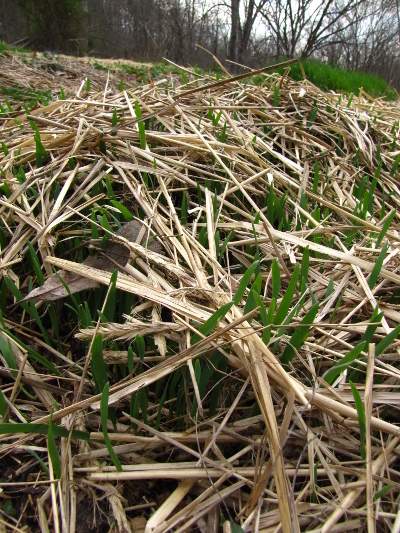 The only major difference between the Back to Eden garden and my version of no-till from a cover-crop point of view is using wood chips instead of straw for mulch. 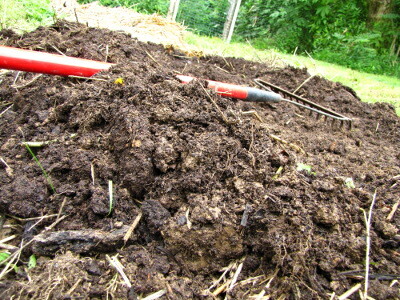 You'll want to rake back the wood chips to expose bare ground before planting your cover crops, and since wood chips will likely smother your seedlings in a way straw won't I'd also rake back a bit of the compost/topsoil as well. After sprinkling your cover crop seeds, just pull the excess soil back over top (leaving the wood chips along the edge of the bed) and you're good to go! I'd love to see your Back to Eden garden full of cover crops. I hope you'll drop back by next year once you have photos to share! 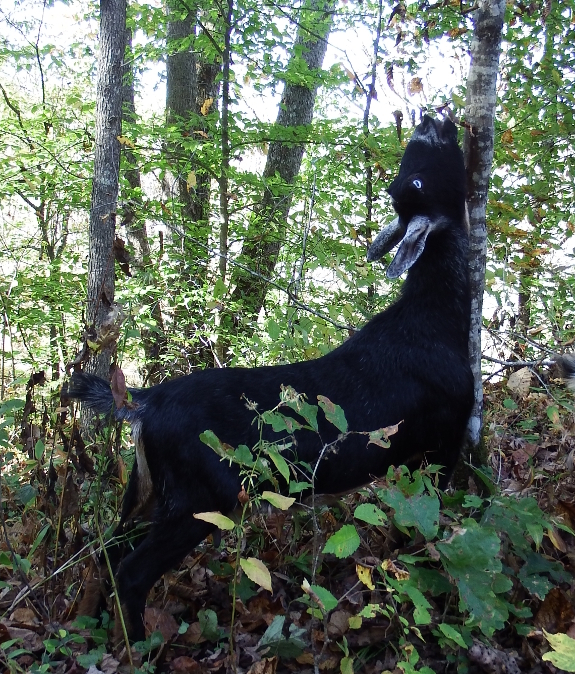 We got all caught up on goat boluses yesterday. Each time gets a little easier. When you live in an average American home, you don't bat an eyelash at filling space with a conventional washing machine. But in a tiny house, the math is considerably different. Once you factor in room to open up the door, a 4.2-cubic-foot, front-load washer uses up nearly ten square feet, which would be almost 2% of the floor space in our small home! Given that data, you'll be unsurprised to learn that we've spent the last ten years washing with alternative devices. My favorite for a long time was the ancient wringer washer that Mark's grandmother gave us...which has the massive benefit of being able to live outside. 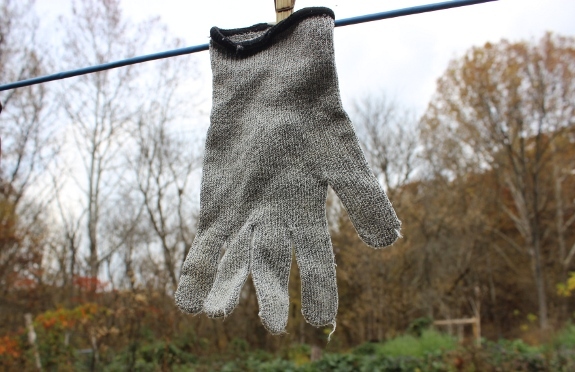 I've really enjoyed open-air washing, too, but have to admit that since I've been sick, I've wished certain things around here were a little easier. Specifically, exterior wringer washers have the disadvantage of freezing your fingers off in the winter and taking about three times as many active minutes as a traditional washer. So why can't you just put a traditional washing machine outside? 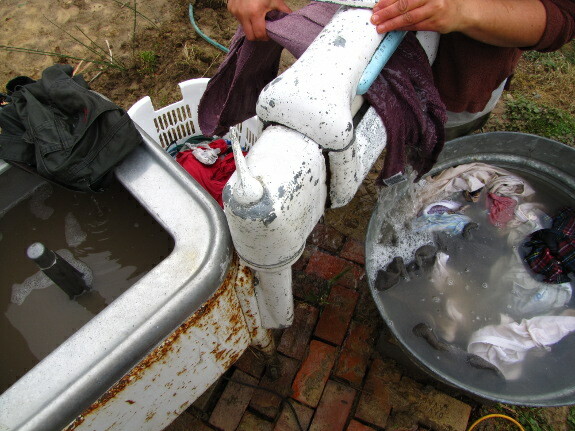 We learned the hard way during our early years on the farm that conventional washing machines never drain fully. The pump that moves water out of the wash chamber keeps a bit of liquid in it even after being done, and that leftover water freezes and busts the surrounding machine in the winter months. Please don't repeat our mistake --- it's wasteful and it just won't work. 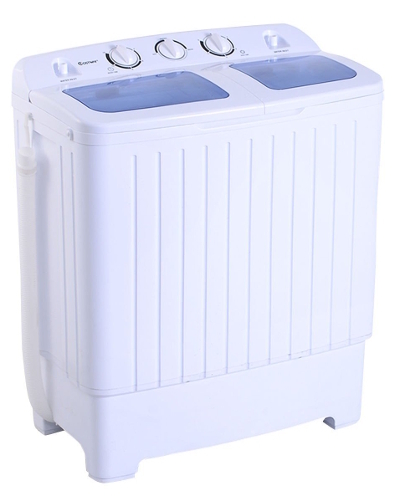 Enter a new class of washing machine that I'd never seen before --- the portable, semi-automatic washer. These little cuties are meant to be filled and emptied with hoses and are light enough to easily move outside after use. Best of all, the model shown here gravity drains, which means it shouldn't have a freezing issue if we opt to store it on the porch between loads. Even if you keep the washer inside at all times, it uses a mere quarter of the floor space of the average front-load washer, so it's a great choice for apartment dwellers as well. Of course, there are always downsides. 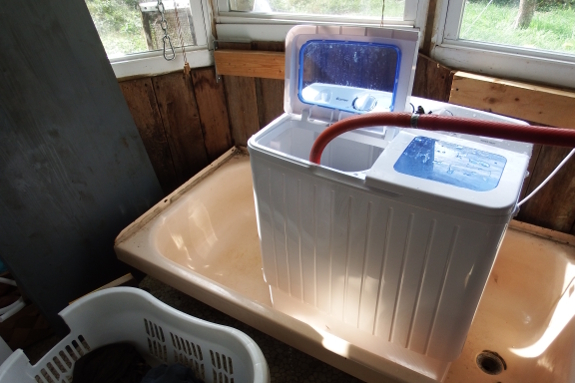 You'll note I called this little device "semi-automatic" --- that's because you have to manually move your clothes into a different compartment for the spin cycle and must run separate wash and rinse cycles. I have a feeling this will be a good compromise between space constraints and time use and will also suit our tendency to accumulate dirty clothes slowly, allowing us to run several small loads per month rather than saving up for one big laundry day. Stay tuned and I'll report back in once we've given it a spin! We felt some fringe effects of the hurricane which prompted backdoor Winterization. The frost-free date is fast approaching --- time to take those storage vegetables inside! 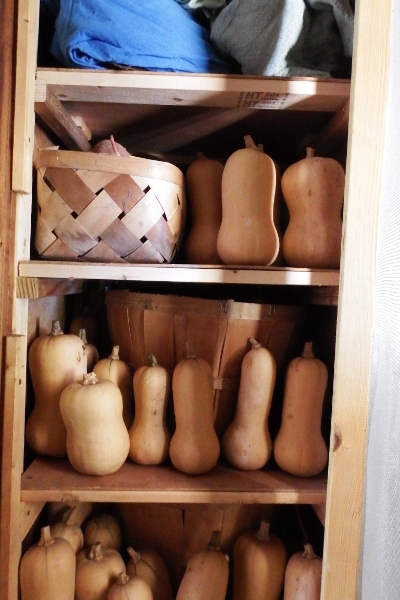 Unfortunately, the butternut closet that Mark made me last year quickly filled up with odds and ends over the course of the summer once its original inhabitants had gone into goat and human bellies. I cleaned out two-thirds of the space, but wanted to leave the towels and sheets on the top shelves for safe keeping. So what was I to do with the other 2.5 bushels of sweet potatoes and butternut squash? For now, the least likely specimens are living under the counter atop the convertible bathtub and under the dining table (not yet in use since we're still dining on the porch). I'm feeding the starchy food sources to Artemesia as fast as I can, both to get weight back on our goat before she's bred and to clear up the floor space before cold temperatures drive us back inside. Despite living amid my goat fodder, I find it hard to complain about four bushels of sweet potatoes and nearly an equal number of butternut squash. The garden certainly did a good job this year when it comes to storage vegetables! I want our new chicken tractor to have big wheels. The plan is to make these 26 inch wheelchair wheels work. With a low that dipped just barely into the 30s Saturday night, I developed a sudden affinity for sun. 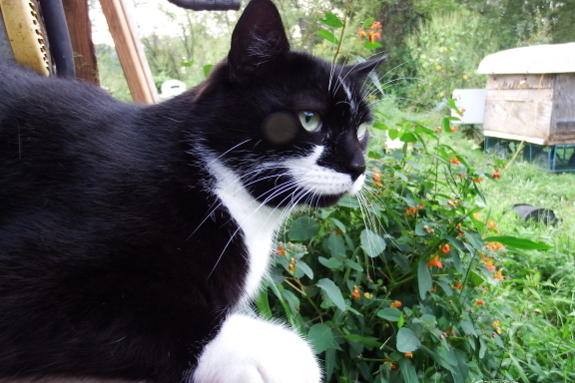 The girls didn't mind at all going out to enjoy the subsequent warm afternoon --- in fact, they led the way. Mark had gone to meet his mom for lunch, so we all welcomed him home at the ford. The only problem with this plan is that Artemesia detests seeing any sort of herd split apart. 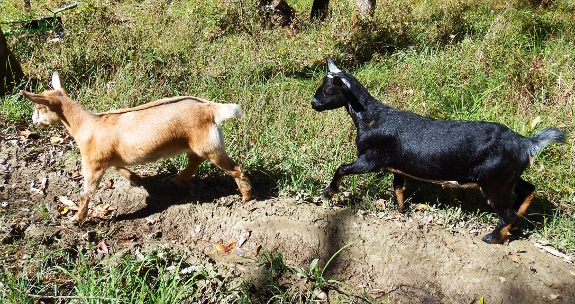 When Mark veers off toward the trailer while I take the girls back to their paddocks, she wavers for a moment before obediently following my lead. One of these days, I'll snap a good shot of our darling does dancing. But I suspect you can feel Aurora's joy in this photo despite the lack of focus. 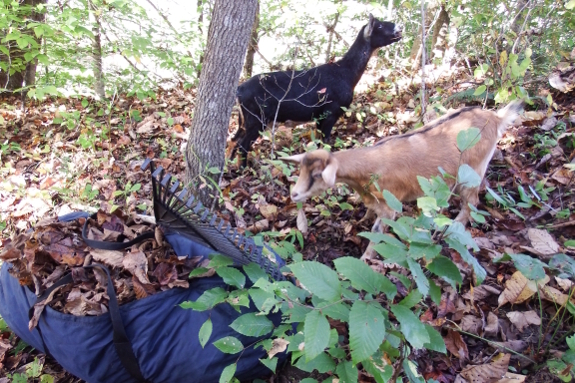 Another wonderful day with goats! Thanks Mom for bringing us an electric stove upgrade today. 1. Mother Earth News won by a landslide, with 79% of our readers frequently checking out this well-known magazine. 3. Grit came in a close third. 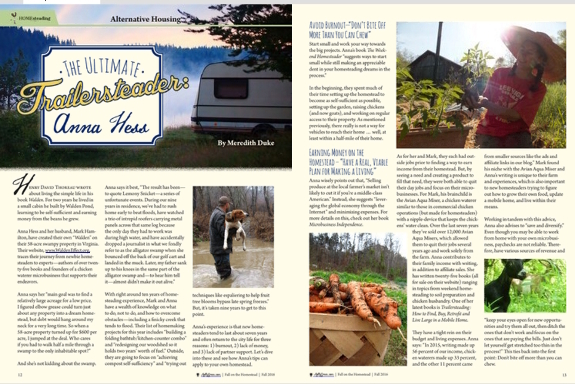 Other magazines enjoyed by at least two of my readers include: Molly Green, Backwoodsman, Countryside, Backyard Poultry (one of my personal favorites), Back Home, Small Farmer's Journal, Organic Life, Permaculture International, and Taproot. Want to join in the fun? You can record your vote here and see up-to-the-minute results afterwards. Happy reading! Stowed away 9 bales of good looking greenish hay for Winter goat feeding. Several of you have asked for a followup on my health. I'm pleased to report that after 2.5 weeks on imodium combined with a very low fiber and fat diet, I'm doing a lot better. As proof of healing, my body is slowly letting me add more fat into my diet, which in turn allowed me to increase my calories back to the recommended level as long as I eat in small meals every two hours. Almost instantly my energy and brain power returned. The next step is to slowly wean myself off imodium. I'm taking this week by week --- last week I cut back to 67% of the previous imodium dose and today I'm down to 50%. Let's hope that sticks! In the meantime, I'm gradually adding the "safest" fruits and vegetables back into my diet to replace the juices and teas which I'd been using as sources of vitamins and minerals previously. It's a slow add --- for example, last week, I started by trying half of a peeled plum as the day's total additional dietary intake. That worked, so I increased to a whole peeled plum the next day, which also stuck. Soon, I'll try peeled and boiled-to-death carrots, then perhaps some raw lettuce or citrus (with membranes removed). I appreciate everyone's well wishes and I hope you know that I couldn't have kept my spirits up without you. Kayla and Mom particularly --- you have been rocks in the turbulent sea of my life this summer and I get so much out of your frequent doses of love. Thank you all for being on my team! I've been hoarding a couple of cover-crop experiments, planning to include them in a revamped version of Homegrown Humus. But, on rereading, I decided that the simplicity of the existing ebook will make it easier for new gardeners to dive into cover cropping. So, I set the current words in stone by turning them into a print book (it's new and cheap --- check it out!) 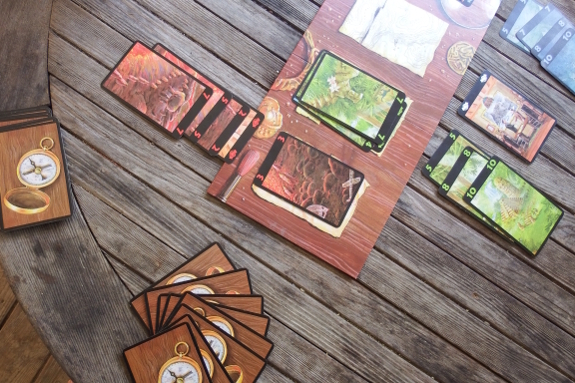 and will be sharing those additional experiments here on the blog instead. 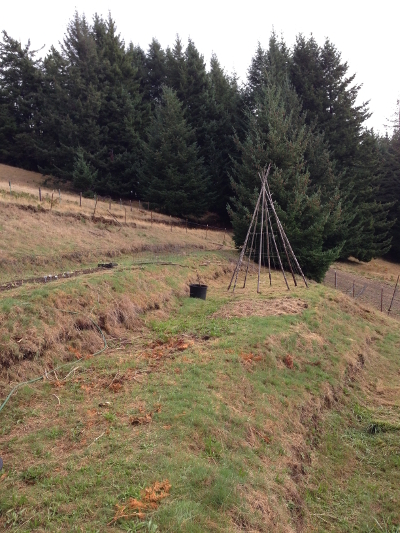 The first of my off-farm experimenters was Charity, who homesteads in zone 9 along the coast of Oregon. 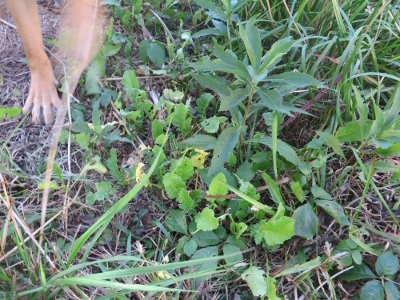 At the time she was experimenting (18 months ago), her garden consisted of weeds rather than bare soil, so she embarked on what basically consisted of modified pasture cropping --- mowing the grass down close to the soil, broadcasting cover-crop seeds, then raked the seeds into the top of the soil as best she could before waiting to see what would grow. Unsurprisingly given those tough growing conditions, Charity saw a lot of problems with establishment and growth. The soil was very dry when she planted and nothing sprouted for a couple of weeks until the first fall rains came to call. By that point, rodents and birds had done a number on the seeds (especially the oats), so her stands were moderately to very patchy. Nevertheless, Charity was able to pick out a few winners that did well despite the initial germination issues combined with low soil fertility. Barley, fava beans, and white mustard all made the cut to be tried again, with the last being handy for early-spring planting since plants bloomed and were ready to mow-kill early in the spring season. Thanks for sharing, Charity! Hopefully other gardeners in the Pacific Northwest and elsewhere will get some ideas from your well-recorded experiments. It was dry enough today to run the sprinklers all afternoon. After using the new tripod sprinklers this Summer we are ready to conclude they are a worthy upgrade to our garden irrigation system. 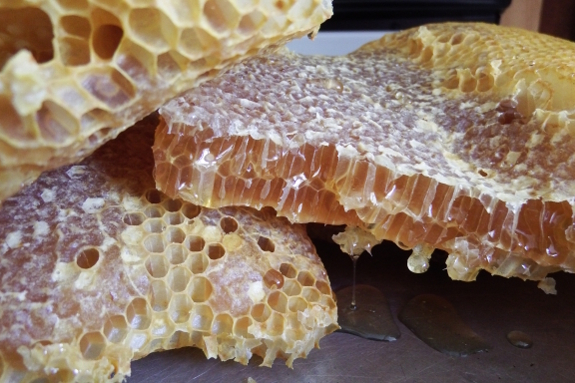 When I checked our hives for mites a month ago, the Warre hive passed with flying colors. The Langstroth hive, on the other hand, had more varroa mites than I would have liked...but not quite enough for immediate intervention. So I decided to take a wait-and-see approach. After a month of wait, it was time to see. A second mite count this week showed that counts had increased a bit but not dramatically in both hives. Still, with a 47 mites/day fall in the Langstroth hive, I opted to try out the rhubarb home remedy we heard about years ago. 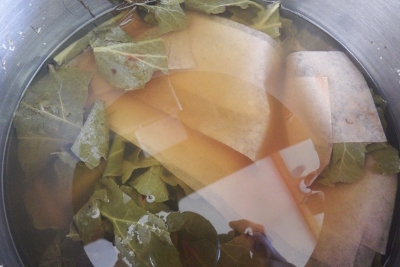 To that end, I took two of the last rhubarb leaves remaining in the fall garden and stewed them in water for a couple of hours. Then I turned off the heat and let sheets of printer paper soak in the water for a while before taking them out to dry. Finally, I opened up the Langstroth hive for the last time of the year. While counting honey stores, I found the quite small brood area and slipped the homemade varroa strips in between the frames. I suspect the bees will chew and remove the strips in relatively short order, so only time will tell whether the remedy has any effect. Let's see if I can remember to do another mite count in the middle of November to gauge the results. 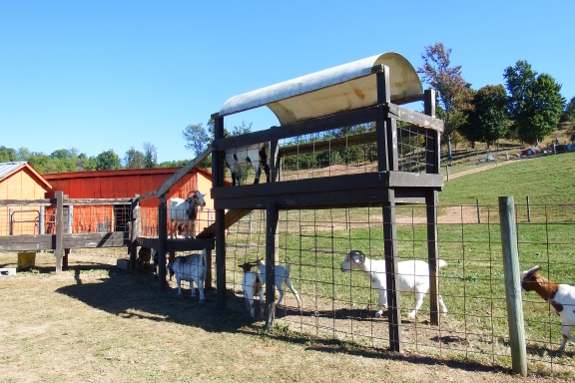 Our friend Walter at the Punkin Patch has a neat structure for his goats to climb on. It also doubles as a shady spot for some of the afternoon. In the Deep South, the garden year is entirely different from what most of us are familiar with. 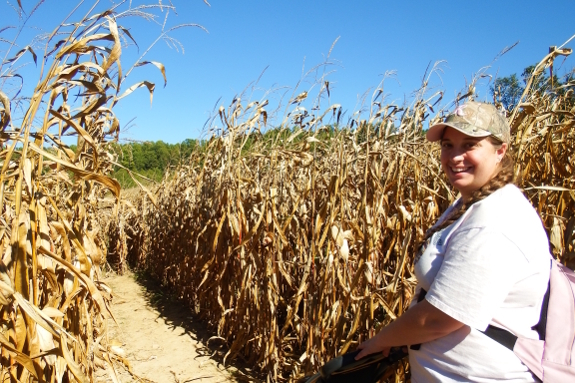 My second cover-crop experimenter, Sara, gardens in zone 8 along the gulf coast of Louisiana, and she was able to grow what I think of as summer cover crops in October, November, and December of 2014. I sent Sara several different types of seeds to play with, but the only ones that sprouted and grew were oilseed radishes, buckwheat, and sunflowers. That last didn't make the cut as a cover crop due to excessive seed predation (the reason we now start our sunflower seedlings inside), but they did manage to keep growing until a hard freeze hit in early January. 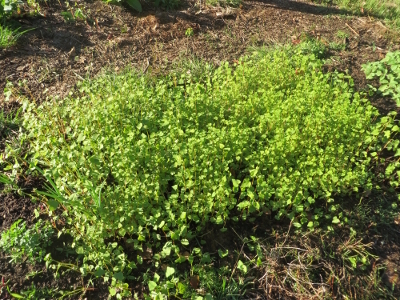 Buckwheat wasn't quite so hardy, but the plants managed to suppress weeds until the first light frost at the beginning of November. 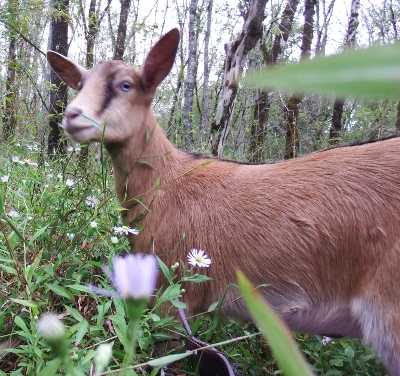 Oilseed radishes are more of a traditional winter cover crop and in previous years, Sara has really enjoyed the amount of biomass the radishes produced in her forest garden. Unfortunately, during the study period the plants didn't do as well in her main garden, probably due to late planting (October 10). You can read more about Sara in her profile in Trailersteading. 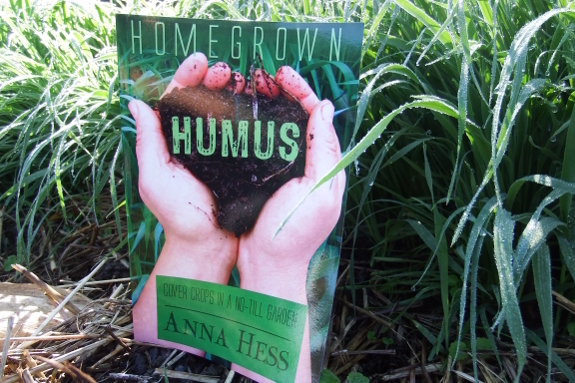 Or check out the new print edition of Homegrown Humus for tips on incorporating cover crops into your own growing year. We've driven the Kubota a little over 30 miles since the beginning. I topped off the tank when it got down to half way recently and estimated that the average mileage for our style of driving is 7 MPG. Adding rhubarb strips to the hive was only of secondary importance when I delved into our apiary this week. 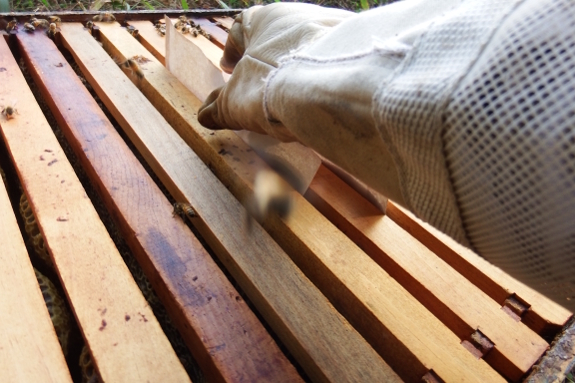 My primary purpose was to make sure that the bees had socked away enough honey to make it through the winter. Last month, the Langstroth hive was 25 pounds low, so I decided to feed them sugar water just in case the fall flowers weren't sufficient to make up the difference. But my brain went fuzzy and I mostly forgot to feed them --- I think I might have given them about ten pounds of sugar, all-told. Luckily for me, the bees knew what to do. The Langstroth hive is now at about 43 pounds while the Warre hive has nearly the exact same amount (without supplemental feeding). Or it did until I pulled out one frame of honey for us that was all alone in an otherwise empty box. That's a major downside of the Warre hive --- it's tough to switch frames around to consolidate living quarters in winter, and this time I figured it was better to take a bit of extra honey rather than making the colony heat a largely useless box all winter long. Our new washing machine arrived...and I got so excited I washed pretty much everything I own immediately. After four loads of laundry, I'm ready to give my review --- I love it! Please keep in mind I've been using a wringer washer for the last ten years, so I have no clue what someone accustomed to a modern American washing machine would think. But I was pleasantly surprised by the capacity (about half of a normal load for me), thrilled by the agitation (clothes end up three times cleaner than in the wringer washer), and impressed by the spin cycle (non-jeans end up dry enough to finish when draped overnight in the house). The model I purchased does have a lint trap, which is a bit fiddly but pulls out about 60% of the lint. On a less impressive note, the instructions are fascinating as a study in computer translation but are nearly unreadable --- good thing there's a how-to video in the Amazon reviews. The gravity drain system is more positive and removes enough water that I'm pretty sure I can safely store the machine on the porch. Overall, I'm thrilled with our choice and look forward to dirtying up some more clothes in the near future. Definitely a good addition to our homestead! I've noticed how our Red Rangers have been lounging instead of ranging these last couple weeks before their retirement date. While Kayla and I were touring Punkin Patch farm last week, we enjoyed a view of the rye field that will provide our homestead's straw in 2017. So green against the autumn brown! 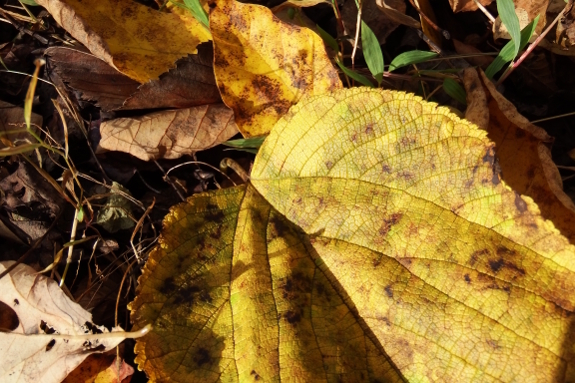 The autumn color in our valley tends toward yellows rather than the fiery reds and oranges you'll see up high. 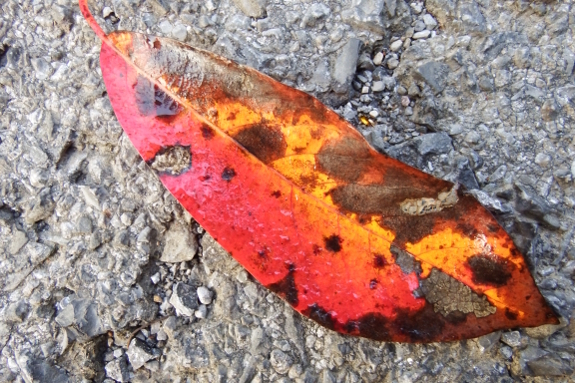 But a few blackgums and other startling leaves trickle in. According to my weather guru, fall is officially running a little late this year...and I don't mind one bit. A few extra weeks to clean up the garden and slaughter broilers before the frost hits is much appreciated. This past week has been the week walnuts have decided to do their Winter drop. 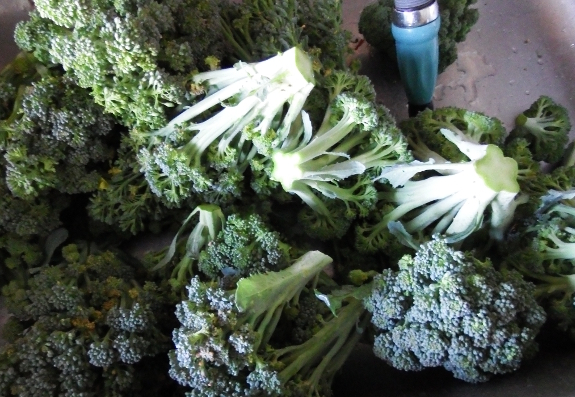 This continues to be our best year ever for broccoli. Most of the increased yield is due to starting the seedlings inside and setting them out at the exact right time from a weather point of view. But this mellow fall has also helped since our second crop has been able to bulk up huge and copious after-florets, producing a crop twice as big as the one a month before. The chicken knife is going on 3 years now and is still a good, safe cut. I thought I was on the mend with my hummingbird diet...and then I started trying to add a few foods back in and it all went to pot. This is the trouble with uncontrolled experiments where you change more than one variable at a time. Luckily, you can always come up with a new hypothesis and try again. 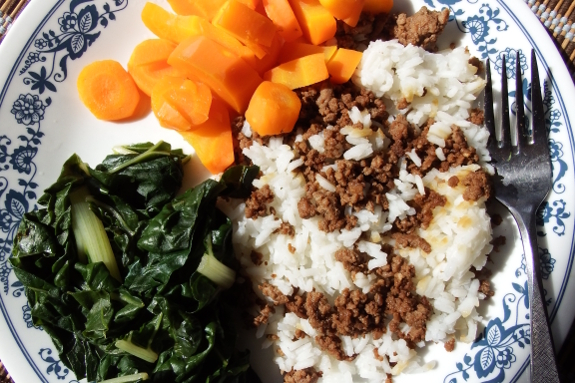 So I pored over the internet some more and came up with another alternative --- carbohydrates known as FODMAPs could be irritating my gut. I was leery at first of adding back in delicious ingredients that I'd assumed had far too much fat or fiber for my bowels to handle. But I was thrilled to learn that aged cheeses, oranges, clementines, lettuce, leafy greens, and carrots have all been well received down there as long as I cook the last two into submission to increase digestability. I almost feel like I'm eating real food again! The plan this time around is to do two weeks of a severely restricted FODMAP diet, then begin trialing the five categories one per week. In case you'd like to start a betting pool, I'm guessing I don't have issues with lactose or galactans but do with fructose and, to a lesser extent, polyols and fructans. Don't you love home science experiments? A good place to be on a rainy day like today is a wooden platform with your Mom. Last year, we were overall quite pleased with our Red Ranger broilers, but I wished their fat was more yellow than white. Did the fault lie in the breed (which forages a lot more than a Cornish Cross, but a lot less than a "normal" chicken) or in the time of year? To answer that question, we started our chicks a month earlier in 2016 so they'd bulk up while the grass was still green and bugs were still copious. This week, we harvested half of our current flock. Unfortunately, the fat is still white, pointing to breed as the culprit. Despite the lower quality fat, I still think Red Rangers are a good compromise for the average homesteader. They're relatively efficient converters of feed to meat, don't die like Cornish Cross, and do produce succulent meat that doesn't require special cooking techniques like heirloom breeds do. 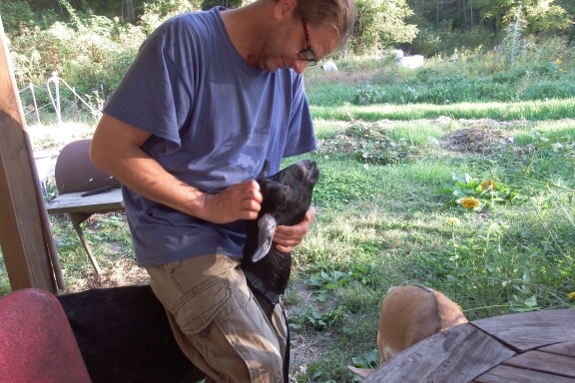 All of that said, in the interest of cutting back our workload so I don't stress myself out again next summer, Mark and I decided to outsource our broiler production to the same folks who provide our pastured lamb each year. So...back to Cornish Cross we go! We came to the end of fresh tomatoes this week. 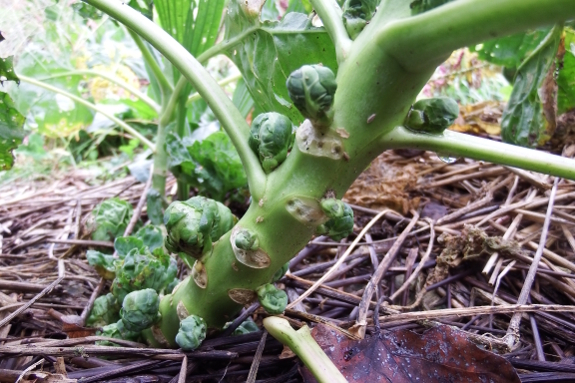 I'm still figuring out the best time to top brussels sprouts to promote sprout formation. In previous years, I've topped them too late (November), so it didn't do much good. 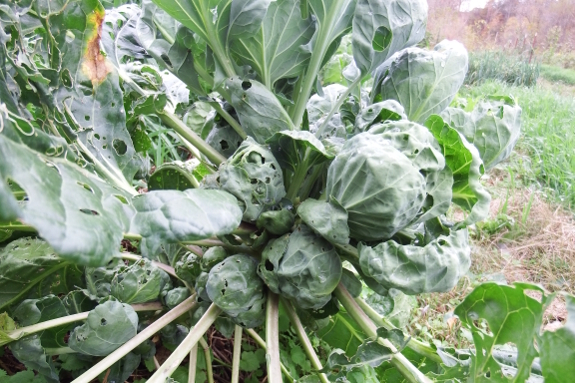 This year, though, I'm pretty sure I topped too early, as you can see in the image above --- the sprouts on the topped plants are turning into new shoots instead of bulking up into edible mini-cabbages. 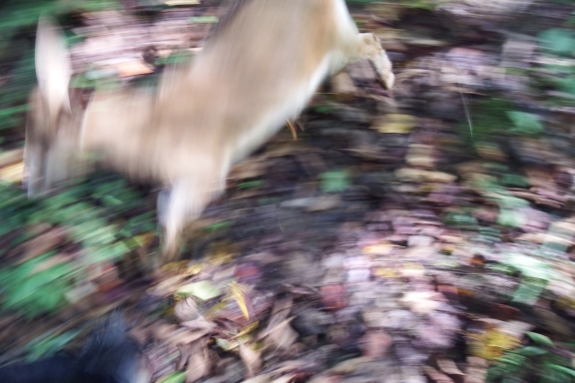 I took this picture while recording sound for a classmate's project yesterday. It seems like you can never have too many AA batteries when you shoot all day. Hmmm, looks like this frost is right on schedule. No more figs or peppers, but no more summer weeds either. Time to light a fire in the woodstove and relax into fall. The new window took about 2 hours to install today. After the first frost, the leaves start to fall faster. 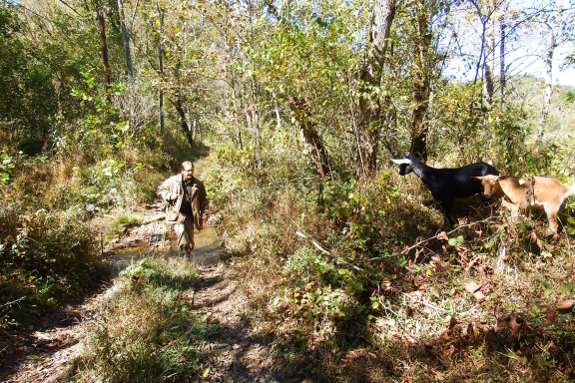 The goats and I are both intent upon collecting as many as possible as fast as possible. Our methods differ a bit, though. I rake and bag so I can easily transport my haul back to the chicken coop. 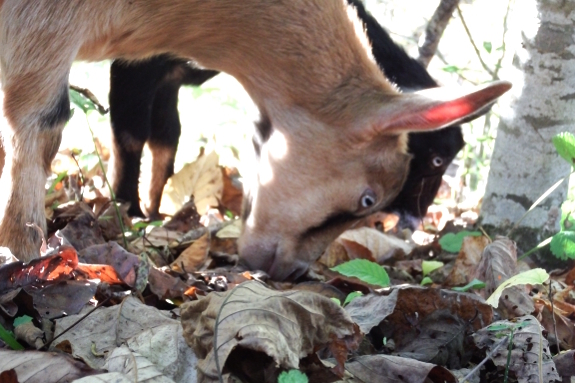 Artemesia and Aurora just nibble, nibble, nibble to digest at their leisure. We both get the job done, though...as long as nobody cheats! We've used a couple of different techniques to label mushroom logs over the years. Previously, we cut squares out of flashing material and scratched a number on each one. That worked well...except sometimes it was hard to read the scratched number and sometimes the sharp edges cut into my hands. Better has been a very simple system using plastic circles that we accumulate while making EZ Misers. One circle is WW70, two circles is Snow Cap, and three circles is Native Harvest. Aside from having to check my key every time I want to know which variety is currently fruiting, the new technique has been trouble-free. What do you do with an electric seed mat when not warming seedlings? 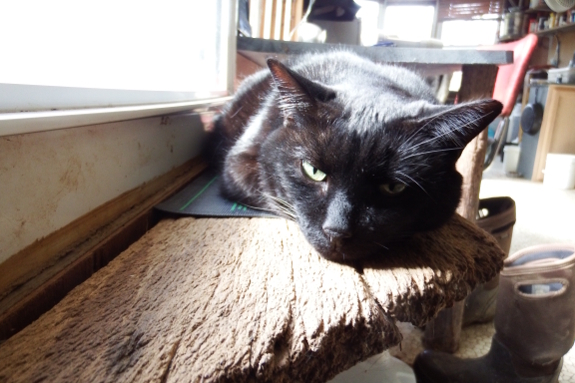 Move it to the cat ledge where Huckleberry can feel warm and special. After the first frost, our weather decided to embark upon a series of frosty mornings. Time to put up the first quick hoop to protect the Christmas lettuce! We'll wait for our second quick hoop, over the long row of kale at the top of this photo, until the weather chills down a little further. For now, I like the easy access of a bed that's open to the air. I noticed some fig leaf curl this week. 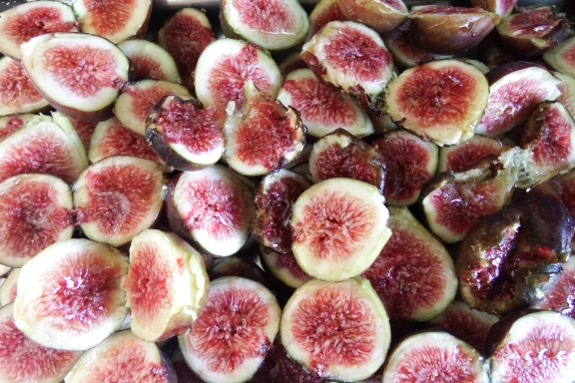 Time to start thinking about fig tree Winter protection. We usually either hatch our own layers or buy unsexed chicks, but this year we decided to take the easy way out. We ordered fifteen pullets and one cockerel as chicks, figuring we'd replace our laying flock without having to kill all the excess males. Unfortunately, predators picked off two of our chicks during their first month of life. And one of those chicks was the rooster-to-be. Most of our roosterless pullets have settled into their hen-party life just fine. But two were boy crazy. They kept flying fences to hang out with the broiler boys in the other set of pastures, so we eventually just let them move right in. Slowly but surely we've been picking off their paramours, though. And, on the final day, the boy-crazy hens got so confused they flew out of the pasture they'd begged to be in so they could chat with the cockerels in the holding pen, waiting for freezer camp. 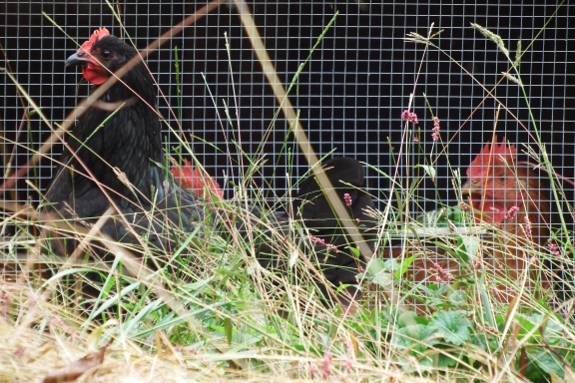 What will our boy-crazy hens do now that there are no roosters left on the farm? Only time will tell. I'm hoping they'll move back in with their sisters. If not, it'll be time for a tractor time out. A surprise leak had me scrambling this afternoon for a solution. Two weeks after treating our Langstroth hive with rhubarb-infused paper strips, it was time for the moment of truth --- had varroa mite counts increased, decreased, or stayed the same in the face of the treatment? 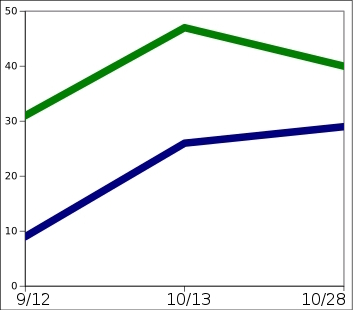 The graph to the left shows the results (blue line is the untreated Warre hive and green line is the treated Langstroth hive). Over the last two weeks, the Warre mite count continued to increase, albeit at a decelerated pace, while the Langstroth mite count actually went down. Of course, these few data points aren't really enough to prove anything. Maybe the Langstroth hive is merely cutting back its brood chamber the way bees always do in the autumn while the Warre hive is a bit behind. Maybe the mites per bee haven't changed in either hive at all. Still, it's a heartening trend, suggesting that rhubarb strips might be a valid alternative to other types of varroa-mite treatment in borderline hives. The big question will be --- which hive is doing better in the spring? Normally I can carry a chicken under each arm when moving them around. Our Red Rangers this year were so feisty I only carried one at a time. A low FOD-MAP diet has worked wonders on my irregular digestive system. 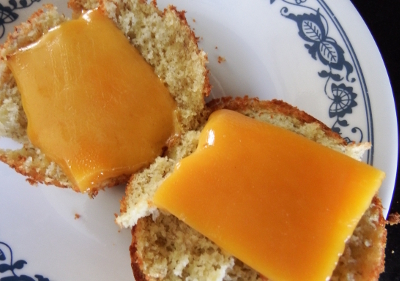 To celebrate being off imodium after a month of daily use, I thought I'd share a recipe that has been a staple of my diet as I've been working on letting my gut heal --- banana rice-flour muffins. Discard the skins and mash the banana flesh, then add the eggs and beat until somewhat fluffy. This is the most important step for making tasty muffins --- too fluffy and the flour won't incorporate properly; not fluffy enough and the muffins turn into rocks. Add everything else and mix well. 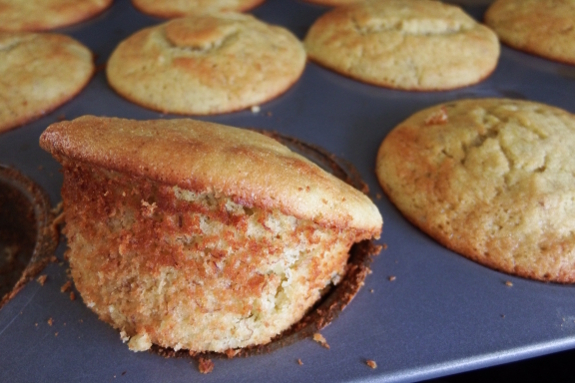 Then fill each muffin well to the brim and bake until the tops are slightly brown and a knife comes out clean. I enjoy these plain, but more often I eat them sliced in two and microwaved with a piece of cheddar cheese on each half. Very mildly sweet and relatively wholesome, these little morsels make my grumpy gut decidedly more friendly. After two more applications over the last year the Lucas power steering stop leak finally did its job at stopping the leak. 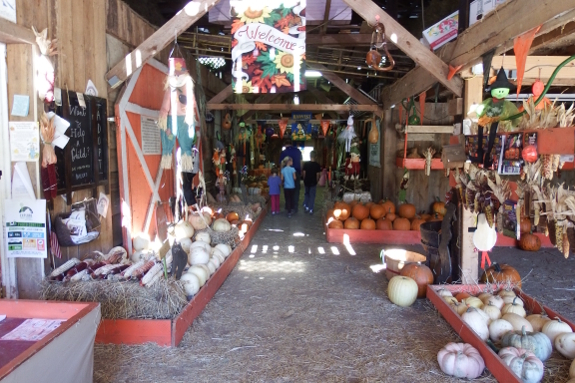 A couple of weeks ago, Kayla and I headed over to the Punkin Patch Farm for a girls' day out. I'd never seen so many pumpkins in one place! Baby D. chose a tiny one just the right size to toss from her stroller, Kayla chose a white one, and I stuck to plain old orange. 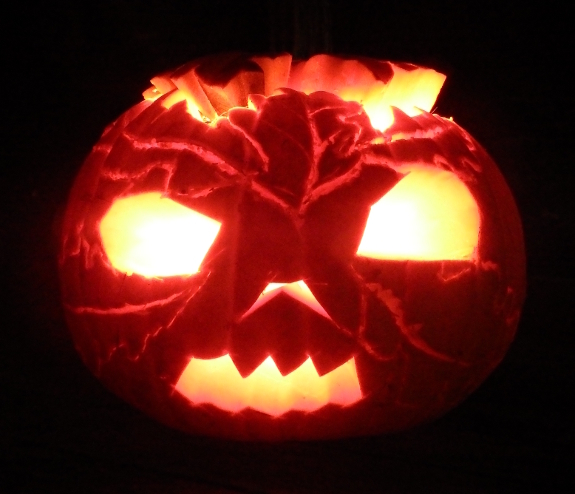 I hadn't carved a jack o'lantern in about twenty years, so the result wasn't particularly artistic. Once I stuck in a candle I'd found floating down the creek, though, my supposed Green Man at least turned into a menacing face --- close enough! Thanks for spurring on yet another round of fun, Kayla! Swinging bridges this week? 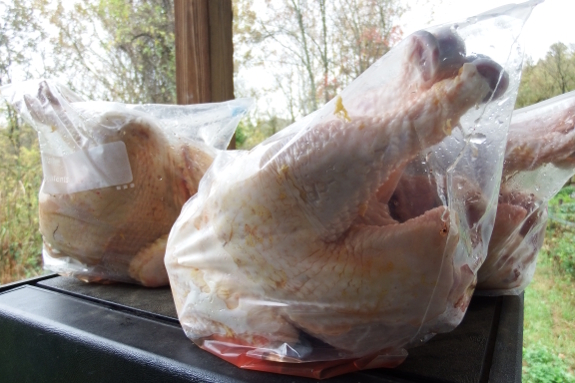 The new cut resistant glove makes chicken day safer. It's washing machine safe and an essential item when retiring chickens with a knife.